On Saturday afternoon, Laure Ferlita and I attended a talk by illustrator Mary GrandPre sponsored by our local arts council. Though GrandPre is probably best known for her illustrations for the Harry Potter books, she’s illustrated seven picture books as well as created illustrations for many editorial and advertising clients. GrandPre was born in South Dakota, but her family moved to Minnesota when she was still a baby. She began drawing at age 5, went through a “Salvador Dali phase,” and later practiced drawing by copying black and white photos from the encyclopedia. After attending the Minneapolis College of Art and Design, she paid her dues waiting tables as she built her portfolio and began to attract clients. 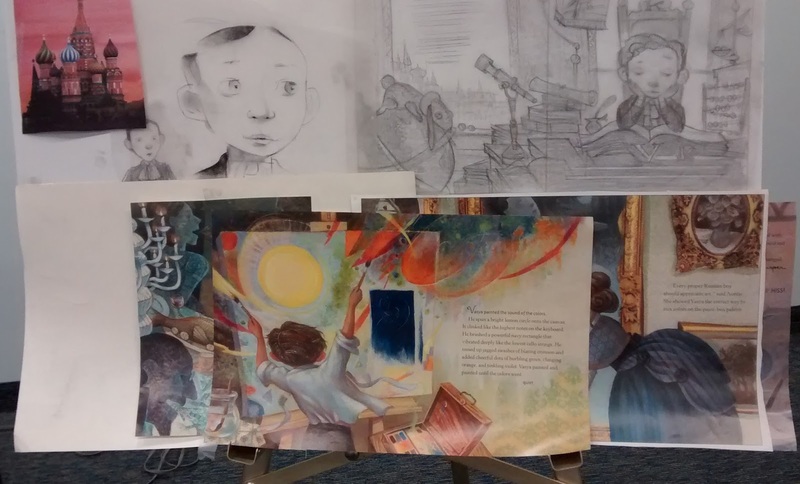 Eventually she moved into illustrating children’s books, and it was her first one, Chin Yu Min and the Ginger Cat, that attracted the attention of executives at Scholastic, Inc., who were looking for an illustrator for a book about a young wizard. At first she planned to turn down the job because she was already busy, she told us, but after the publisher encouraged her to read the manuscript, she changed her mind. As she told Communications Arts Magazine, “It sounded like a nice job, so I said ‘sure.’ I presented three cover sketches, they chose one, and I was pretty happy with everything. They were great to work with, and I think I remember them saying there might be more. At the time, it just seemed like another job.” GrandPre is grateful for the popularity of Harry Potter, but she’s just as proud of (and deservedly so) her other work, which includes The Noisy Paint Box, The Carnival of the Animals and Henry and Pawl and the Round Yellow Ball, a project she worked on with her husband, Tom. I knew nothing about the process of illustrating books, so I was interested in how she described it. After researching her topic, she begins sketching quickly, often using tracing paper and ink. Sometimes, she said, she does get stuck, especially at the beginning of the process. She tries not to get discouraged if she ends up with nothing usable after a day of work, believing that there are no wasted days. “The next day will be better because of today,” she said. After some back and forth with the art director of the project, the sketches are finalized. She likes to have three to four months to complete the final paintings. She has worked in pastels, acrylics, oils, and charcoal, and has used collage in at least one of her projects. I was impressed with how kindly and patiently she answered audience questions that ranged from “How can I encourage my child who loves to draw?” to “I’m writing a children’s book—how do I find a publisher?” After her talk, we were able to examine some of her work close up, and it was beautiful. She grew up attending Catholic school and church, and she mentioned that one of her early influences was the glow of the light coming through stained glass windows. I think that same glow fills her work. You can learn more about Mary GrandPre and see some of her work on her website, marygrandpre.com. Thank you for sharing this! Her work does glow...I loved hearing a bit about her process as an illustrator. Sounds like a fun and very interesting presentation. Wish I could have attended with you and Laure. Rita--You're welcome. My photos don't do her art justice. It was really beautiful. Cheryl--It was. And we would have loved to have you along. Happy Thanksgiving!